Hiking and walking on small group nature tours in California’s most beautiful hidden treasures. The state of California reaches from the picturesque Pacific Ocean to the majestic granite mountains of the Sierra Nevada, to the volcanoes of the Pacific Ring of Fire. This area offers a wide variety of fantastic landscapes and wilderness areas that are best discovered on foot. Our small group hiking tour starts in San Francisco, the most scenic city in the Northwest. Our nature tours begin by exploring the beautiful Pacific coast on hikes where we will see some rare wildlife including a elephant seal colony. In the White Mountains of the Sierras we will come face to face with the oldest trees in the world that have lived for more than 4500 years in this harsh climate above 10000 ft. in elevation. Our trails will lead around mountain peak, volcanoes and high mountain lakes created by glaciers and lava flows. Meadows of flowers at Yosemite National Park will stand in contrast to the high prairie of the Great Basin Desert. We will experience nature at its finest in this untouched vast countryside. Come along and feel joy and renewal by nature’s vitality. For more details and information visit Sierra Nevada Trails. Day 1: Meet at the hotel lobby in San Francisco at 5 p.m. We will be driving over the Golden Gate Bridge with a photo stop getting to know each other at dinner in Sausalito (not included). Your tour guide and driver will share some important information about the tour and will hand you a travel itinerary. Day 2: Hike along the picturesque Pacific Ocean shore trail at Año Nuevo State Park to a rare elephant seal colony. Lunch will be a picnic in Año Nuevo. Stop in Santa Cruz to explore the West’s oldest amusement park directly on the beach, featuring an historic pier with lots of great seafood snacks. Spend the evening at the Fisherman’s Wharf in Monterey. We will spend the night at a Bed and Breakfast Inn in Pacific Grove nearby to Monterey. Day 3: In the morning we will drive and walk along the 17-Mile-Drive with its exquisite shore views and famous golf courses. Visit the historic Carmel Mission and its beautiful gardens. Hike and picnic at Point Lobos State Park, a flower and birding paradise. In the afternoon you have the choice of optional whale watching tour or a visit to the world famous Monterey Bay Aquarium. Day 4: Leaving the Pacific we stop in Salinas for a visit to the John Steinbeck Center with an interesting exhibition on the Nobel Prize winner’s books, as well as some history about California’s agriculture. Today’s hike will be along the San Luis Reservoir with its nice picnic areas. In Mariposa we will have a short guided tour through the California Mining Museum. 2 nights in Mariposa – Enjoy the swimming pool! 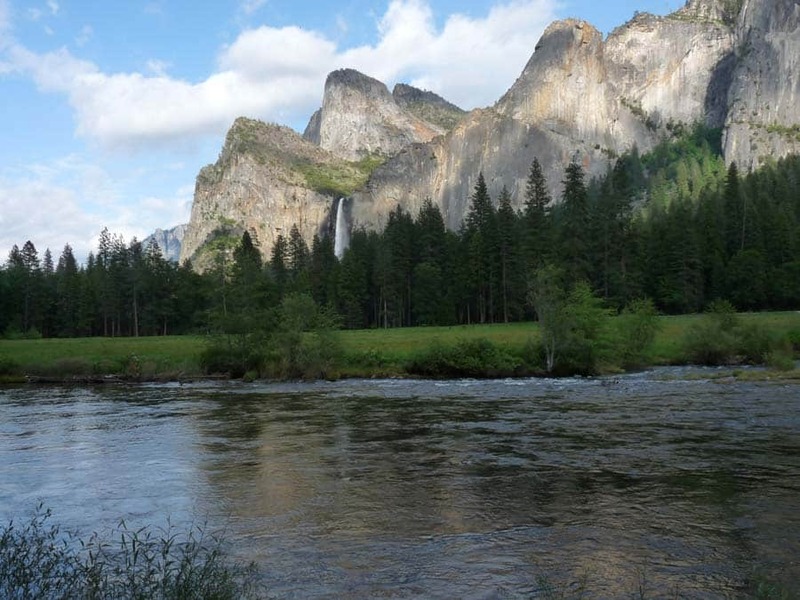 Day 5: Today’s highlights are hikes in Yosemite National Park with its beautiful waterfalls and giant sequoia trees. We will stop in at the Visitor Center and fascinating Native American Museum. Day 6: Drive over the scenic Tioga Pass in Yosemite Park and hike across mountain meadows 12000 ft. above sea level. At the east side of the Sierra Nevada Mountains we will reach the high prairie of the Great Basin Desert and explore the geothermal area along an idyllic creek. The following three nights we will stay in the busy little town of Bishop where there are several nice restaurants. Day 7: Drive up a mountain pass emerging 12000 ft. in elevation among the White Mountain Range. We will hike among the oldest trees in the world in the Ancient Bristlecone Pine Forest, an incredible sight. In the late afternoon we will relax at an historic natural hot springs.